Cephacare Flavoured 50mg Tablets for Cats and Dogs are indicated for the treatment of infections of the respiratory tract, urogenital tract, the skin and localised infections in soft tissue caused by bacteria sensitive to cefalexin. 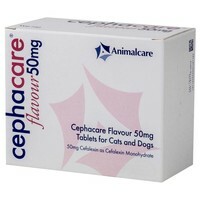 Cephacare 50mg Tablets are also for the treatment of infections in the gastro-intestinal tract of cats. Each tablet contains 50mg of cefalexin. The tablets can be administered by hand or mixed in with food if necessary.